Only 150 metres from Agia Pelagia Beach, 9 Muses offers self-catered accommodation with Aegean Sea view from their furnished balcony. Guests can start their day with buffet breakfast enriched with local products. Each includes a TV, as well as a private bathroom with free toiletries and slippers..
Maneas Beach Hotel Just 10 metres from Agia Pelagia Beach in Kythira, Maneas Beach Hotel features rooms with free WiFi and a furnished balcony overlooking the Aegean Sea and the garden. Breakfast is served in the dining room or in the sun terrace with views of the sea. Staff at the 24-hour front desk can offer information on nearby beaches such as Firi Ammos and Lagada Beach, both within a 10-minute walk..
Perlegiannika Houses price per day from € 55 Located between 2 gorges, surrounded by cypress hills and olive groves, Perlegiannika Houses consists of two traditionally built villas with fireplace, free Wi-Fi and furnished verandas overlooking the scenic countryside. Each has a well-equipped kitchen or kitchenette with cooking facilities, fridge and coffee machine. Anatoli price per day from € 40 Just 50 metres from the beach of Agia Pelagia, Anatoli is built according to the local architecture offering self-catered accommodation with free Wi-Fi. Their kitchenette is equipped with cooking hobs, a mini fridge and coffee maker. Romantica Hotel Apartments price per day from € 50 Within 100 metres from the beach of Agia Pelagia, in Kythira, Romantica Apartments offers rooms with fully equipped kitchen and free Wi-Fi. Guests can start their day with a buffet breakfast, and later enjoy a refreshing drink or cocktail from the bar by the pool. Venardos Hotel price per day from € 35 Overlooking the picturesque bay of Agia Pelagia, Venardos Hotel offers air-conditioned rooms with balcony and free Wi-Fi access. It includes a swimming pool, an indoor hot tub and a sauna. A private bathroom equipped with hairdryer is standard. Romantica Hotel price per day from € 40 Just 30 metres from Agia Pelagia Beach, Romantica Hotel offers air-conditioned rooms with balcony overlooking the Aegean Sea. Guests have access to free WiFi and a rich breakfast buffet. They are equipped with fridge, safety box and LED TV. There is a TV and lots of seating space in the hotel’s lounge for guests to relax..
Pelagia Beach Studios price per day from € 25 Featuring traditional island architecture, this hotel is situated only 50 metres from Agia Pelagia Beach. 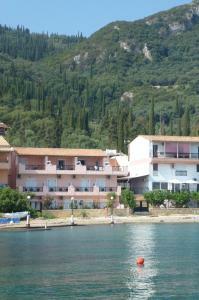 All studios at Pelagia Beach are air-conditioned and include a telephone, safety deposit box and a private bathroom. Venardos Studios price per day from € 40 Just 50 metres from Agia Pelagia Beach in Kythira, Venardos Studios offers self-catered rooms with a balcony overlooking the Aegean Sea. The sister hotel across the street offers access to its pool and gym. Kythereia Hotel price per day from € 18 Situated in the northern part of Kythira, in Agia Pelagia village, Kythereia Hotel offers air-conditioned rooms with balcony. Each room is equipped with air conditioning and a private bathroom with shower. Guests can find free public parking near the premises..
Filoxenia Apartments price per day from € 80 Only 150 metres from Agia Pelagia Beach, Filoxenia Apartments features an outdoor pool and a poolside snack bar. Stylish with hand-picked items, all air-conditioned units open to a balcony or terrace with mountain, garden or Aegean Sea view.